Posted January 18, 2019 at 7:42 am . 1 comment. 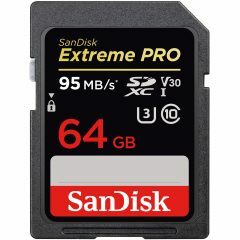 An even better deal on a faster SD card: Adorama and B&H Photo Video have the SanDisk 64GB Extreme PRO SDXC UHS-I Memory Card for $22.99. Adorama has free shipping. This card is rated up to 95 MB/s read and 90 MB/s write, with a guaranteed 30 MB/s write minimum (U3 and V30 speed class). Free shipping from Adorama but not B&H so Adorama cheaper by far!